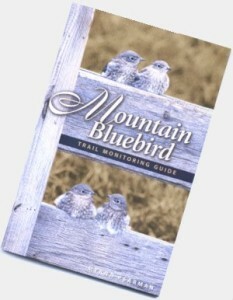 The aim of the booklet is to encourage more people to become interested in Mountain Bluebird conservation and establishing bluebird trails and also encourage current trail monitors to communicate with each other so that Mountain Bluebird trail data can be compiled from across this bird’s range. There is so much about the life cycle and natural history of the Mountain Bluebird that is still unknown: Where do non-resident Mountain Bluebirds go foe the period of time between fledging and when the bird regroup prior to migration? What are the dynamics of courtship and nest site selection? Do clutch sizes vary geographically, with latitude or altitude, over the course of the breeding season, according to box floor size and/or according to the age of the female. Bluebird trail monitors can contribute significantly, through careful observation and data collection, to our understanding of the ways of the Mountain Bluebird. Don’t miss the series of spectacular photos documenting the daily development of Mountain Bluebirds from egg to adult. Clear line drawing show you step-by-step instructions for building bluebird nest boxes. Legal issues are addressed. This is the best book for the beginner or professional Mountain Bluebird trail operator on the market. Authour Myrna Pearman has produced another classic. Red Deer River Naturalists is pleased to offer Mountain Bluebird Trail Monitoring Guide for $6.95 (CDN) plus shipping and handling (usually about $2.50, depending on where it must be mailed). To order, just click mailing form.